By reconstructing the position of the sun, the condition of the tides and the view from Claude Monet's hotel room, researchers were able to determine the time and day Monet painted his dreamy piece "Impression, Sunrise" in Le Havre, France. 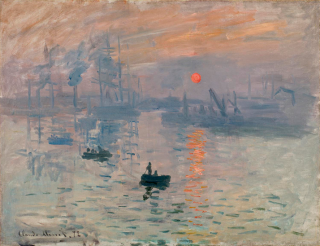 Astronomical clues could pinpoint the day Claude Monet painted "Impression, Soleil Levant (Impression, Sunrise)," the art piece that lent its name to the Impressionist art movement. Based on the celestial detective work of Donald Olson, a Texas State University astronomer and physics professor, curators think they've identified the moment that Monet attempted to capture from his hotel room in the city of Le Havre, France: Nov. 13, 1872, 7:35 a.m.
Olson has a history of using astronomy to settle such historical minutiae. He corroborated Mary Shelley's account of the moonlight streaming into her window when she awoke from the nightmare that inspired her to write "Frankenstein." In another study in 2010, Olson linked the "strange huge meteor-procession" referenced in American poet Walt Whitman's "Leaves of Grass" to a rare procession of earth-grazing meteors that streaked along the horizon in 1860. He has also calculated the direction of the moonlight on important moments in American history to explain why Paul Revere wasn't spotted by British sentries on a nearby ship in 1775 and why Confederate general "Stonewall" Jackson was mistaken for the enemy when he was shot by his own troops in 1863. Olson's latest findings are described in catalog for "Monet's Impression Sunrise: The Biography of a Painting," an exhibition on display at the Musée Marmottan Monet in Paris from Sept. 18, 2014 to Jan. 18, 2015. To settle the case, Olson first turned to historic photographs of Le Havre to reconstruct the southeast view Monet must have had from his hotel room. The sun in Monet's painting appears as it would have roughly 20 to 30 minutes after sunrise, Olson found. He then calculated when this time would have corresponded with high tide, the only time large sailing ships could have entered the shallow harbor. He was left with 19 possible dates. To narrow his options further, Olson looked at historical weather reports and ruled out stormy days. The curve of the smoke plumes on the left side of the painting hint that the wind was blowing east, leaving Olson with just two options: Nov. 13, 1872 and Jan. 25, 1873. Art historian Géraldine Lefebvre argued in the exhibition catalog for an 1872 creation date, matching the "72" painted next to Monet's signature on the canvas that was sometimes dismissed by curators who favored an 1873 date. "It is pretty clear that Monet started from observations from his hotel window during this visit to Le Havre, but then he showed his artistic genius by expressing emotional content that goes beyond literal depictions," Olson explained in a statement from Texas State University. "Knowing the details of the harbor scene in this painting only increases our admiration of the artist’s skill in depicting this sunrise."